By completing this form, you agree to submit your personal data to the BAPA. The data collected by this form are strictly limited to your surname, first name and e-mail address and will be used exclusively for the transmission of our publications. Your personal data will be processed by restating our privacy statement. 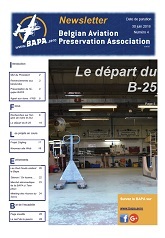 Reception of the bulletin "Latest news"
After sending your message you will receive a copy of your data within 24 hours via the e-mail "news@bapa.aero". You may change your mind at any time by clicking on the "Check your registration" link located on the footer of any e-mail you receive from us, or by contacting us at news@bapa.aero. By clicking below, you agree that we may submit your information in accordance with these terms.